Our yearly Night of Remembrance is a time when we honor each other’s losses and walk together through life’s darkest days.This evening is for all who grieve and especially those actively experiencing grief in its most painful early stages. We may have had the opportunity to be part of a funeral or memorial service; this is a time to speak and to listen from the perspective of our mindfulness practice. Please consider bringing a photo or a memento to place on the memorial table we will create at the center of our circle. 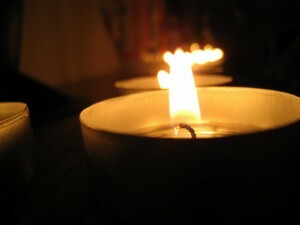 After our meditation period, we will share memories of loved ones who have passed. What would we like our mindfulness community to know or understand about our loved ones? What are we learning as we bring the fruits of our study and our practice to our grief? Now seven years and many new losses since the death of my mom and dad and twenty years past the wrenching death of my younger sister, I believe more strongly than ever that death and loss are our greatest teachers. Working through my sister’s suicide opened me up to a completely new way of being. I wouldn’t learn the language until later, but these were my earliest dharma teachings. The learning continues. Memories continue to fade, but Mom, Dad and Joanne have become steady – if not always predictable – companions and teachers. The opportunity to share with the sangha – especially on that very first Night of Remembrance is one of my most beautiful Still Water memories. My Dad’s funeral was unsatisfying spiritually but by the end of our evening together, I felt more connected to the sangha and more committed to mindfulness practice than ever before. It’s been my experience that the magic happens every year. I have found it also to be true that although I learned to value pain and loss, I’d still rather skip the lesson. Can it really be true that pain and loss are not the ugly intruders that I easily slip into thinking they are? Again and again, I catch myself bristling at the notion–not rationally, of course, but at the level of “felt” experience – that I myself should age, become ill and die, and that this is the fate of my loved ones. Thankfully, mindfulness calls me back to the present moment and provides tools to work with fear and the temptation to turn away. Death, the ultimate “this is it”, insists that there is no escape and when I accept this and sit with it, I am opened to compassion and understanding. I rest my weary head and lean into my soft heart. A raging and singular self no more, I am able to feel my connection to all beings and take some comfort there. On behalf of the Still Water family, I invite you to be part of this year’s Night of Mindful Remembrance. We want to hear about your loved ones, your griefs and the ways in which your loved ones continue to be present in your lives. I’ve included two brief readings below, one on the many dimensions of grief, and a second on the reality of Inter-being. Most think of grief as a momentous sadness but it is a lot subtler than that. Everyone has grief. Everyone seems to have some unbalanced tally sheet with life, some unfinished business. An incompleteness with the past and with ourselves, a fatiguing self-consciousness, the predominant theme of the unfinished symphony of mind’s yearning. Our grief manifests as a self-judgment, as fear, as guilt, as anger and blame. It is that insistent mercilessness with ourselves and a world which we hardly let within. Our grief is our fear of loss, our fear of the unknown, our fear of death. Grief is the rope burns left behind when what we have held to most dearly is pulled out of reach, beyond our grasp. We think we have a self. But there is no such thing as an individual separate self. A flower is made only of non-flower elements, such as chlorophyll, sunlight, and water. If we were to remove all the non-flower elements from the flower, there would be no flower left. A flower cannot be by herself alone. A flower can only inter-be with all of us… Humans are like this too. We can’t exist by ourselves alone. We can only inter-be. I am made only of non-me elements, such as the Earth, the sun, parents, and ancestors.